Young adults suffered from 54 straight months of double-digit unemployment rates between January 2009, when President Obama first took office, to June 2013. Young adult unemployment reached its height at 13.3 percent in April 2010. Last month’s rate of 6.3 percent is the lowest the rate has been since May 2007. 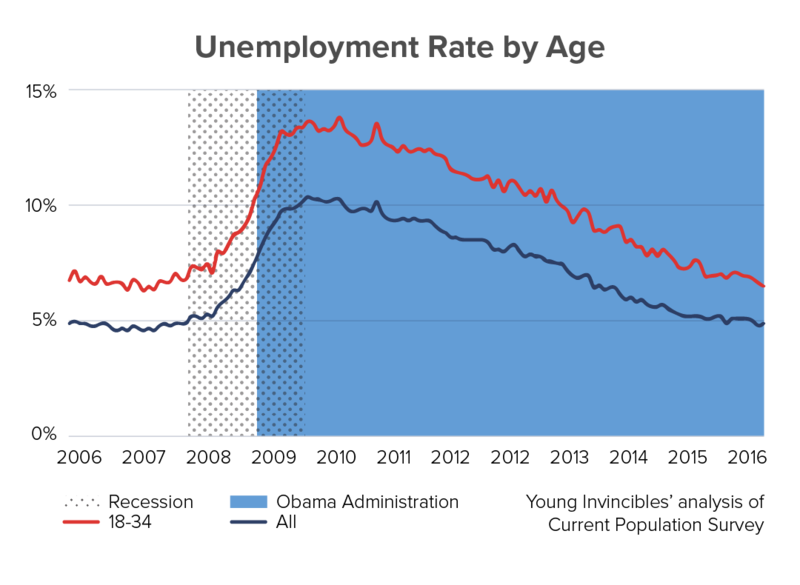 This graph below tracks the unemployment rate among young adults and the workforce generally over the last decade. It also highlights the weak jobs market President Obama inherited from the Great Recession and the slow recovery through his administration. The Recession (dotted area) officially began in December 2007, over a year before Obama took office (blue shading) and continued for at least six months into his presidency. Starting with the recovery in June 2009, the unemployment rate for young adults steadily declined to last month’s historic low. 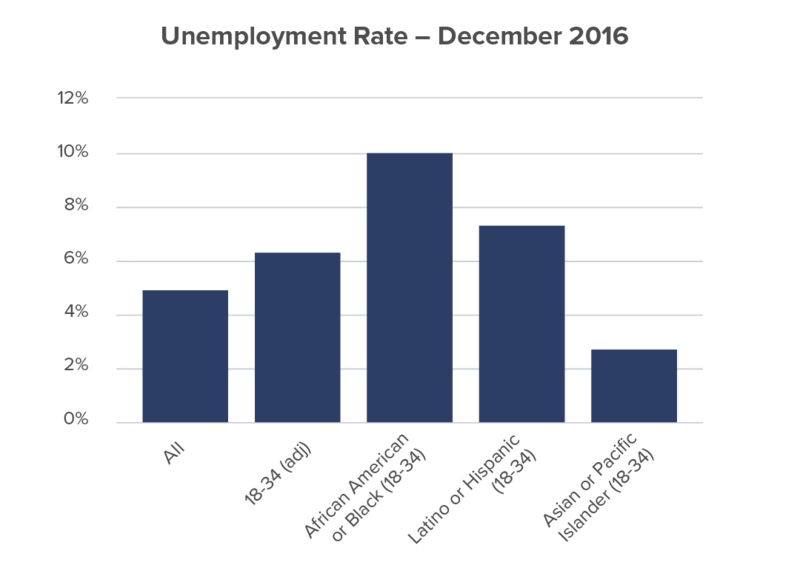 Taking a closer look at the most recent unemployment rates for December of last year, we see that despite overall gains, that young African Americans still suffer from the highest unemployment rates, double the rate overall, at ten percent. Young Latino adults also have higher rates at 7.3 percent. Young Asian or Pacific Islander adults had the lowest unemployment rates at 2.7 percent. While the jobs market has generally recovered from the Great Recession in the short-term, last week Young Invincibles released new research analyzing long-term declines in financial security, which show that today’s Millennials earn lower incomes, own homes at lower rates, and have amassed fewer assets and wealth than Baby Boomers when they were the same age.